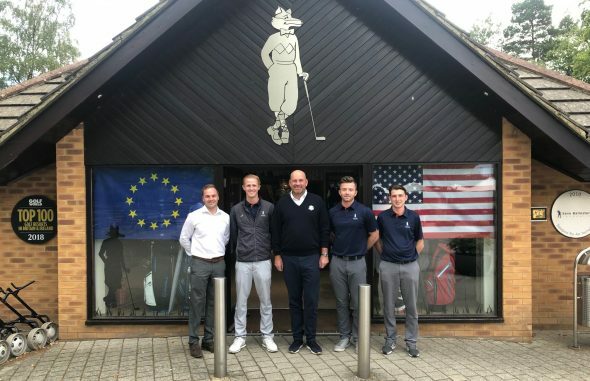 The Dane leads Team Europe into battle against the USA at Le Golf National in Paris on Friday but warmed up for the frenzy with a trip to the more relaxed surroundings of the Surrey resort. Although he may have appreciated the opportunity to unwind with a short break and a trip to the award-winning spa, Bjorn was instead there to undertake media duties with Foxhills friend and Sky Sports presenter, Nick Dougherty. But Bjorn did find time play a few holes and met some of the Foxhills junior members to pass on a few tips during his visit, while members and staff wished him luck in his quest to bring the Ryder Cup back to Europe. There are several Ryder Cup connections at Foxhills already with the Bernard Hunt course named after the former head professional, who was a stalwart of the event during the 1950s and 1960s in a distinguished career. And 2018 team member Paul Casey – who has played in three previous Ryder Cups – started his golf career at the venue, progressing through the Foxhills Foundation on his way to a successful professional career. For more information, visit www.foxhills.co.uk.